Thank you to Beagle Research Company Limited for their generous support. You or your company can become a major supporter of IEWF (subject to approval) and have your name and logo displayed here. To discuss the terms please contact us. and Restoring Natural Capital Alliance (RNC Alliance) Pacific website. Our aim is to educate about the impacts of weeds on our natural environment, to restore degraded ecosystems, improve native habitat and improve the natural function of urban landscapes. One of our projects is the Habitat Network, an example of Restoring Natural Capital in the urban environment. See our Habitat Network website	www.habitatnetwork.org where you can find out about conserving and creating habitat for small birds and other native animals. In May 2011 this project won awards from Sydney Metropolitan Catchment Management Authority - a 1st (shared) Innovation Award and a Highly Commended for Urban Landcare. In 2012 we opened a community native plant nursery and community food garden, The Habitat, in Ryde in order to further this project. In 2017 The Habitat and our Shrimptons Creek habitat corridor project won the Greater Sydney Landcare Group Award and were finalists in the Landcare NSW awards. We continue to work with Councils and community to enhance habitat corridors. For quick and easy identification of common garden weeds, potentially invasive plants and environmental weeds go to Web Weed Lookup. Also find out more about what weeds are, how they are spread and how to control them. You will find lots of weed identification photos to help identify common weeds. If you have quality weed photos to contribute please email them to info@iewf.org with details of scientific name and location where found. This brochure is useful for anyone involved in weed removal (bush regenerators, bushcare volunteers and all gardeners). It highlights how some weeds are being used as habitat by small birds and other native animals and the need to regenerate or restore native replacement habitat before this weedy habitat is removed. "This publication is the outcome of a Cooperative Research Centre for Australian Weed Management project, and is aimed at a large range of users from Commonwealth, state and local government officers, to researchers, horticulturists, nursery owners, farmers, landscapers, consultants, groups of volunteers looking after remnant bushland to home gardeners. Everyone who uses plants needs to be aware of the weed potential of those plants and to be able to make informed decisions about which ones to use in their operations. I hope to see a time, and not that far away, where the use of weedy plant species will no longer be accepted in public and private plantings in Australia. This publication is offered to help people to make responsible decisions in the types of plants they use in the future." A wealth of weeds information can be found on the archived Weeds CRC website. The Weeds CRC was functional from 1995-2008. 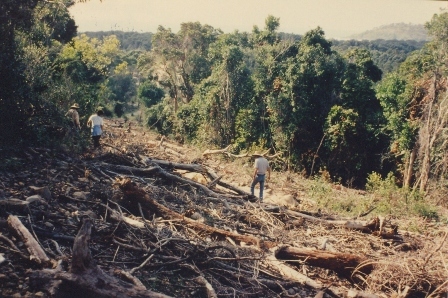 Restoration of Natural Capital (RNC) involves any activity that invests in the replenishment (improved quality) of natural capital (native flora & fauna, biodiversity, water, soils, air and sustainable land use) and as a result improves the flows of ecosystem goods and services for the benefit of people and the environment. Read more about Restoring Natural Capital. The Habitat Network project aims to extend habitat and reconnect isolated populations of small native birds, which are being lost from our urban areas. By recreating native plant connections we will improve the ability of our native birds, animals and plants to survive. Follow this link to find out more about the Habitat Network and to visit the Habitat Network website. You will find brochures, resources and links related to habitat creation. Our brochures and documents can be downloaded and used by schools or for community projects. Find out about the science behind this project and what you can do. All donations made in Australia are tax deductible as we are a registered environmental organisation, see Register of Environmental Organisations. To make a donation please go to our Donations page. All donations are used for on-ground works. We are all volunteers and so no money is used for administration. International Environmental Weed Foundation (IEWF) was registered in July 2003 and is based in Sydney Australia. We educate and facilitate projects relating to conservation, improved biodiversity, the restoration of degraded ecosystems and restoring natural capital. Our Web Weed Lookup helps people discover what may be found in their own backyard and surrounding areas and provides excellent resources for schools and their environmental programs. All of our projects are growing through community involvement. If you want to be involved, use our resources or join the Habitat Network email us at info@iewf.org. We are the co-ordinator of the RNC Alliance in the Pacific, Habitat Network and The Habitat. Our conservation project, an important habitat link between Hat Head National Park and Limeburners Creek National Park "For Rest" is an example of our active dedication to conservation and restoration. In 2008 we received a three year Private Land Conservation grant from the Foundation for National Parks & Wildlife. In 2011 we received an additional 3 years funding assistance. Thank you! These funds contributed to the removal of bitou bush and other weeds and also to improved biodiversity in both the dunal and adjoining Littoral Rainforest areas on our project site - For Rest. If you need weed photos you can copy from this site if you ask us first - please email. We also include links to other sites who are working on similar projects. If you would like your site included please contact IEWF at info@iewf.org.